A girl wakes up after having collapsed with no memory of who she is with a spirit that only she can see for company. No-one can know that she has amnesia is it made evident that it has not been caused by her body or mind. The heroine, surrounded by handsome gents in the cafe she works at, must piece together her life with the help of her spirit companion. 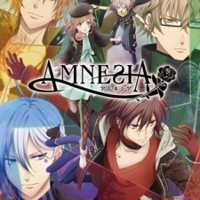 367 users rated Amnesia ????? [TV].